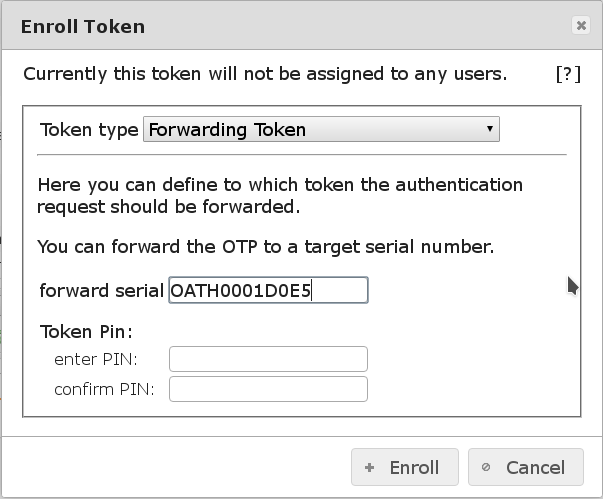 An eToken NG-OTP can only be enrolled using the command line client. An eToken NG-OTP is a USB based token, that does not have a preinstalled HMAC key. The secret HMAC key is generated by the management client and installed to the token and stored in the token database without any person seeing this HMAC key. For enrolling eToken NG-OTP you need to have the Aladdin/SafeNet PKI Client installed. LinOTP is also capable of using other OTP algorithms and thus supports many different tokens. So it is also possible to enroll mOTP Tokens which you can download at http://motp.sourceforge.net. These are time based open source OTP tokens that can be installed on a mobile phone. mOTP token apps exist for Android phones, the iPhone and also for older feature phones. You can find recommended mOTP apps for Android and iPhone in the section Recommended Mobile Apps. Please refer to the project website on how to install the mOTP on your feature phone. As to the app for the feature phone you may initialize the mOTP application at any time anew. Initializing mOTP means, that a new OTP key – in this case it is called Init-Key – is created on the mobile phone. This can be done by entering ‘0000’ when the mOTP application asks ‘Enter PIN:’. When you have installed the mOTP to your mobile or to the mobiles of all your users, each mobile needs to create its secret key. In the LinOTP management client press the button “enroll”. You need to enter the OTP key, that was generated on the mobile phone. The user needs to make up a 4 digit passphrase, that he enters each time, when he wants to generate an OTP value on his mobile. This is the mOTP PIN. The mOTP PIN is the PIN that gets entered on the phone and is also used to calculate the OTP value. When you enter a wrong mOTP PIN on the phone, the phone will calculate a wrong OTP value. This must not be confused with the OTP PIN. You may now press “OK” and the management client will generate a serial number for the token for you. 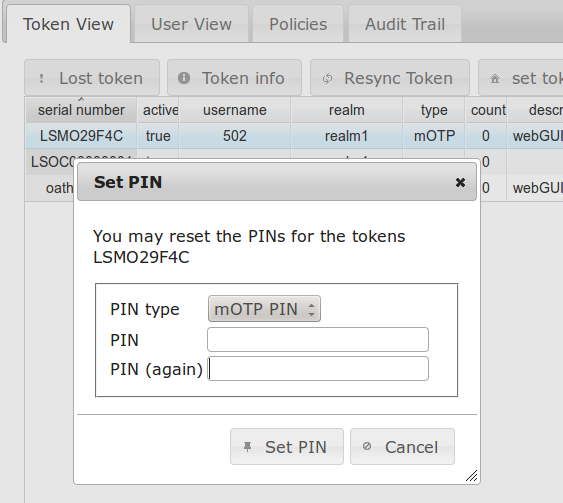 If you need to change the mOTP PIN later click “set PIN” in the WEB UI and choose “mOTP PIN”. You may also want to set an “OTP PIN”, that the user needs to enter in front of the generated OTP value when he wants to authenticate. You may realize, that there are several softtokens (e.g. for mobile phones) around that use the HOTP HMAC-Based One-Time Password Algorithm defined in RFC4226, TOTP (a variation of HOTP) Time-Based One-Time Password Algorithm defined in RFC6238 and OCRA OATH Challenge-Response Algorithm defined in RFC6287. 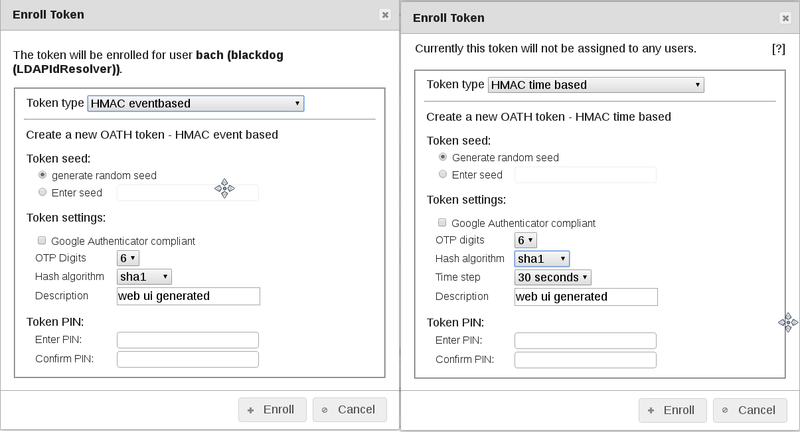 Select one of these tokens to register and create an HMAC secret key/Seed during initialization. If necessary, select the user in userview for whom the token should be rolled out. Enter the secret, that was generated by the token. Or generate a random seed. For HOTP and TOTP, you can use: Google Authenticator compliant. This sets some defaults like the OTP-Length which are known to work well with the Google Authenticator app. But the Web UI offers additional functionalities and is the recommended management tool. The Web UI can have the LinOTP server generate the HMAC seed. 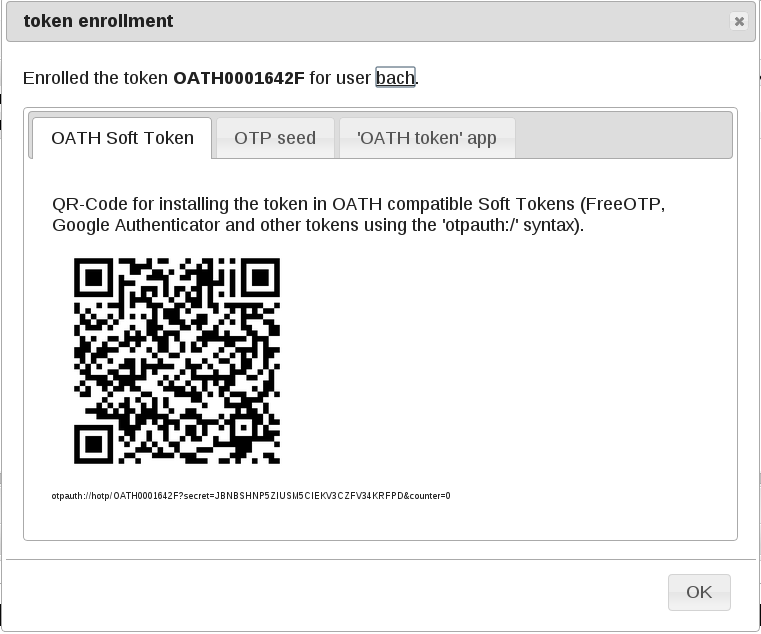 Some Apps like the Google Authenticator, the Android token or OATH token can import this seed using a QR code. The LinOTP server can generate such a QR code. The QR code is scanned with the app on the mobile phone and the mobile can be used as token. This token allows a users to authenticate with a fixed password instead of an OTP. In some cases it might be necessary that users authenticate without a one time password, but rather with a fixed password. This may be, if your authentication client is not capable of routing users to OTP authentication and other users to password authentication or in cases, where a user may have lost his OTP generator or to allow temporary logins for externals. A PIN can be set and the PIN policy applies. Please be aware: this is a very weak second factor and possibly compromises the security. The Simple Pass Token is a special version of the static password token. Instead of setting a password the OTP value is empty and the PIN of the token can be considered to act as password. So the usefulness of this special type of token highly depends on the overall authentication infrastructure and the OTP PIN policy. If you do not set an OTP PIN now, the user will get successfully authenticated ALWAYS! So you now should set an OTP PIN for this token. The user may now authenticate against LinOTP by providing only this PIN. If you selected a user and this user has a mobile phone number defined in the user store, this phone number will be automatically entered in the phone number field. You may of course change this. Press OK and the token with this mobile phone number is created and assigned to the selected user. If you need to change the phone number later, you can do this in the tokeninfo dialog. To be able to change the phone number a policy scope:admin,action:set must be configured. See Admin Policies for more details. For a convenient rollout of SMS token Linotp provides (starting from version 2.7.2.2) the command line tool linotp-enroll-smstoken. It can be used to rollout and assign token to a single user, to users in a certain realm or even for all users which have a mobile number stored in their UserIdResolvers. If you use KeyIdentity LinOTP Smart Virtual Appliance 1.2 or older the script will be installed (/usr/bin/linotp-enroll-smstoken) but can not be executed due to library version conflicts. Please copy the script to a machine running a recent distribution of linux and start it from there. 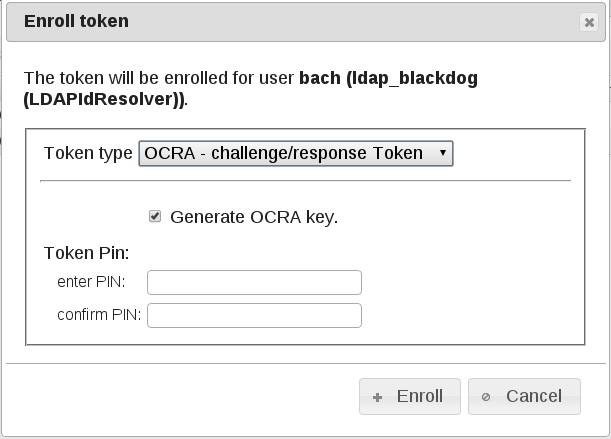 A Voice Challenge Service has been set up (available for KeyIdentity customers only). A Voice Provider is defined. Policies for the voice token are created. Choose the token type “Voice”. If a user is selected and this user has a mobile phone number defined in the user store, this phone number will be automatically entered in the phone number field. The number can be changed. If OK is pressed the token with this mobile phone number is created and assigned to the selected user. The use of the Voice Challenge Service is included in a corresponding support contract. Please contact support@keyidentity.com for help and documentation KeyIdentity GmbH provides the required infrastructure for the Voice Token for their customers. A Remote Token forwards the authentication request to another LinOTP server. So the calculation of the One Time Password is not done on the first LinOTP server, where the User is authenticated but on the remote LinOTP server. The Remote Token can be defined this way, that only a serial number and the OTP value is forwarded to the remote server. This token with this serial number needs to be located on the remote server of course. Thus, a remote server can hold all OTP tokens without knowing any users and without having any tokens assigned to any users. On such a remote server not even a UserIdResolver needs to be defined. The authenticating LinOTP (first) server will do no OTP calculation and thus will not know any secret keys (HMAC keys) since it forwards all requests to the remote server. To enroll a Remote Token just choose enroll and then the token type “Remote Token”. Then you need to enter the remote LinOTP server and the serial number of the token on the remote server. Alternatively you can specify a user on the remote LinOTP server, if the token is assigned to a user. If you specify “https://localhost” as the remote server, you can assign one single physical token to several users, by pointing the Remote token to a local token of another user. You may choose if the checking of the PIN is done locally or remotely. Do not set a PIN on the local LinOTP server. The entered credentials will be completely forwarded to the remote LinOTP server. The PIN that was set on the remote server will be used to authenticate the user. In this case, the PIN on the local LinOTP server is verified. If the PIN on the local server matches, the remaining part of the credentials will be sent to the remote server. On the remote server NO PIN should be set for the token, otherwise authentication might fail. In this scenario a remote server can hold one physical OTP token with no PIN, while all the Remote Token on the local machine get individual PINs and can be assigned to different users. The Forwarding Token is the simple form of the Remote Token. It can be used to share the same token between different users. The main difference to the Remote Token is that the referenced token must be at the same LinOTP server. Configuration is very simple - just point to the serial number of the desired token. PIN policy etc. is applied for the authenticated user. A RADIUS Token can forward the authentication request to another RADIUS server. This can be any kind of RADIUS server. The RADIUS token can be well used for migrating existing RADIUS scenarios. You may also define, if the OTP PIN is checked locally on the LinOTP server or if the complete password is forwarded to the RADIUS server. Choose “enroll” and then choose the token type “RADIUS Token”. Enter the RADIUS server name including the port and the other required information. specify the length of the potential OTP value, i.e. how many characters of the password will be split and sent to the RADIUS server. If you choose to check the PIN on RADIUS server the complete credential will be sent to the RADIUS server. Pairing: The first part of the token is transferred to the user’s mobile via a QR code. This contains the required the information for the activation process. Activation: The token on the user’s phone is activated. Please see Setup KeyIdentity QR Token for details. Please note - the KeyIdentity Authenticator APP is required which is available for iOS and Android. Transactions and logins are validated by the user’s phone. The login program (like the KeyIdentity Authentication Provider) displays a QR code which is scanned with the KeyIdentity Authenticator APP (available for Android and iOS). The user approves the action on the phone and the login / transaction is validated by LinOTP. The QR Token features an offline mode in case the mobile or the login program can not contact the LinOTP server (e.g. in an airplane). Please see KeyIdentity Push Token Policies for details about the required policies and Push Provider for KeyIdentity Push Token how to configure the needed Push Token Provider. Transactions and logins are validated by the user’s phone. The login program (like the KeyIdentity Authentication Provider) triggers a push message to the KeyIdentity Authenticator APP (available for Android and iOS). The user approves the action on the phone and the login / transaction is validated by LinOTP. The use of the Push Challenge Service is included in a corresponding support contract. Please contact support@keyidentity.com for help and documentation KeyIdentity GmbH provides the required infrastructure for the Voice Token for their customers. 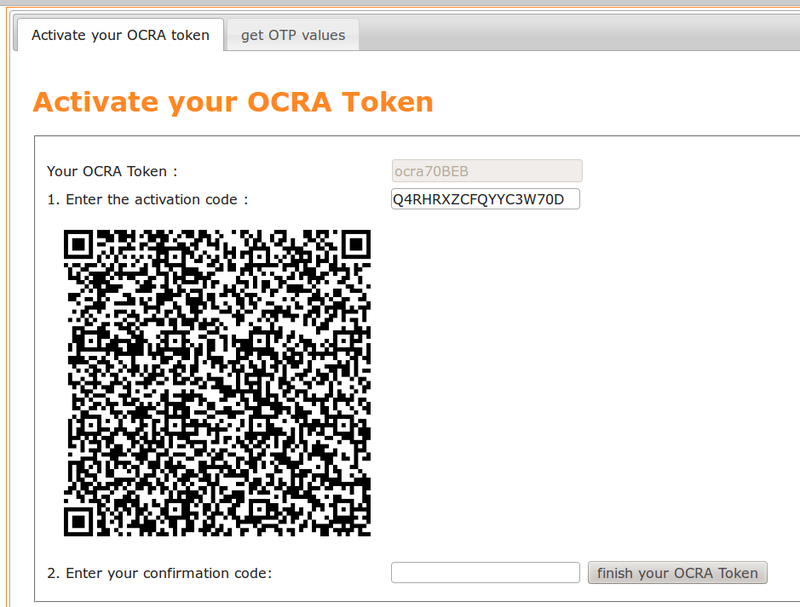 A QR-TAN Token is a special OCRA Token that can be enrolled via a QR code process and where the challenge is also transmitted via a QR code. 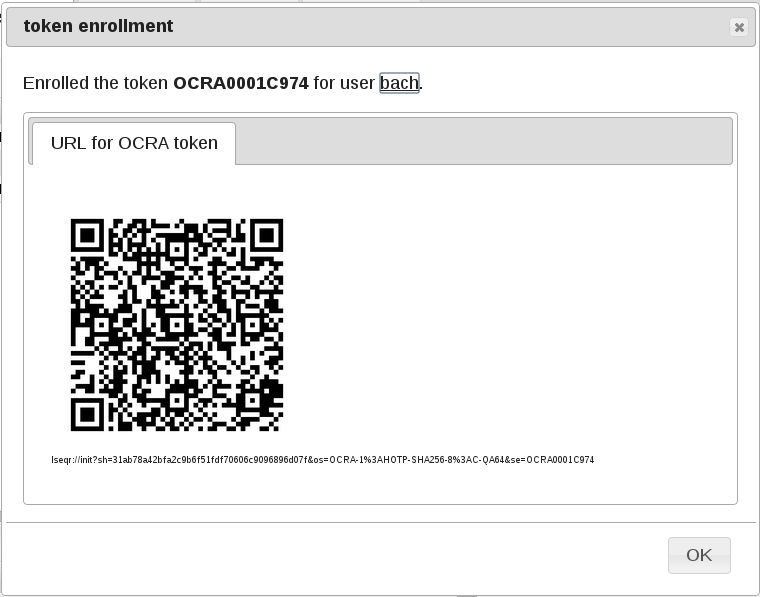 You can either start the QR enrollment via the API (/admin/init) or you can start the enrollment of the QR Token via the management web UI. Please note, that you need the KeyIdentity QR-TAN App which is available on request for iOS and Android. 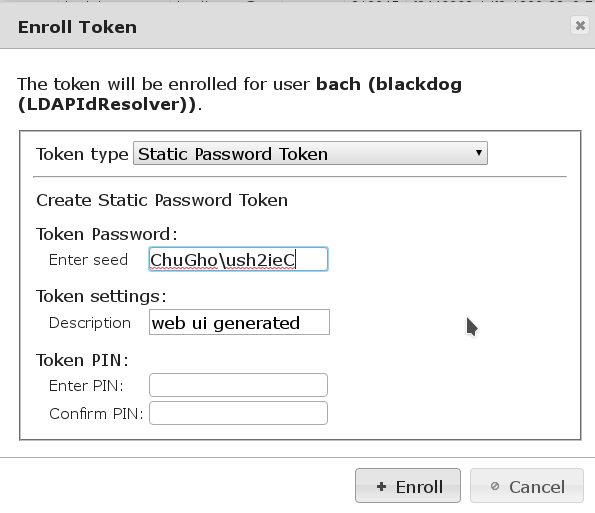 Select a user and press the button “Enroll Token”. The displayed QR code needs to be scanned with the users smartphone. Alternatively you can print the QR code and hand it over to the user. In a second step the user needs to login to the Selfservice Portal and go to the tab “Activate your QR token” and select the corresponding token. The user needs to enter the activation code, which is displayed on his smartphone and then needs to scan the second QR code, which is displayed in the selfservice portal. Now the QR Token is enrolled and ready for use. Cloud mode - which is the Yubico mode, that is not validated by LinOTP but the request is forwarded to the Yubico Cloud service. 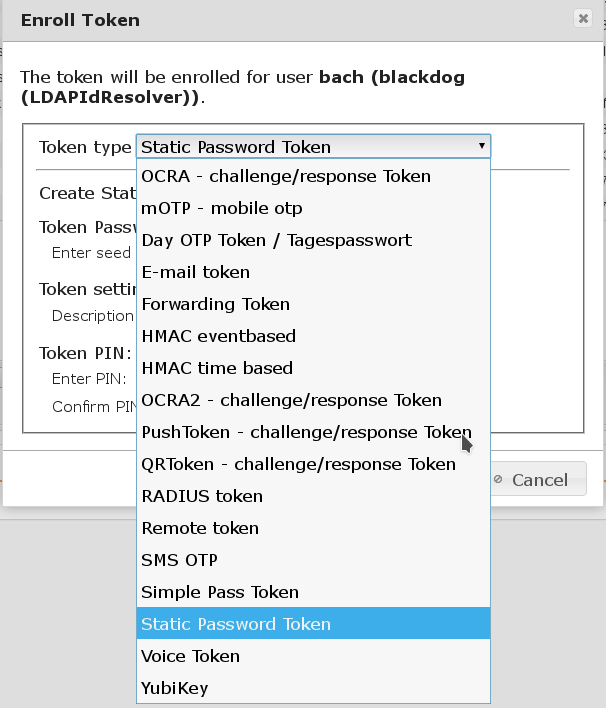 Challenge Response mode - which is used by as TOTP mode by the YubiKey NEO NFC. The OATH mode, Yubico mode and the Challenge Response mode can be programmed to either slot 1 or slot 2  of the YubiKey. The OATH/HOTP mode is identified by the token type “HMAC”, since internally the OATH algorithm is used. The prefix for the serial numbers is “UBOM”. “OM” stands for OATH mode. This will enroll a YubiKey OATH mode to slot 1. The serial number that is stored in LinOTP’s database is read from the YubiKey hardware. So if you enroll the same token a second time, it will not create a new token object in LinOTP but will overwrite the old token object. The Yubico mode is identified by the token type “yubikey”. The prefix for the serial numbers is “UBAM”. “AM” stands for AES mode, since internally this algorithm uses AES. You can choose whether the Yubico mode should be programmed to slot 1 or slot 2. In this example the serial number of the YubiKey is also prefixed in front of the output. You can in fact enroll a YubiKey in OATH mode in one slot and in Yubico mode in the other slot, which will result in two token objects in LinOTP, which also could be assigned to two different users. The YubiKey also can emit a static password. The YubiKey static mode is identified by the token type “pw” . The prefix for the serial numbers is “UBSM”. “SM” stands for static mode. You can choose whether the static mode should be programmed to slot 1 or slot 2. You can in fact enroll a YubiKey in OATH mode or YUBICO mode in one slot and in static mode in the other slot, which will result in two token objects in LinOTP, which also could be assigned to two different users. The Cloud mode is identified by the token type “yubico”. The prefix for the serial numbers is “UBCM”. “CM” stands for Cloud mode. The YubiKey in Cloud mode can be enrolled via the Selfservice Portal or the management web UI. To enroll via the Selfservice Portal the policy action “enrollYUBICO” needs to be set. The YubiKey is used as it comes from Yubico’s factory. The authentication is forwarded to the Yubico cloud service. To assign the YubiKey to the user, the user needs to go to the Selfservice Portal and position the cursor in the entry field “TokenId”, insert the YubiKey and just needs to push the button on the YubiKey. The 12 first characters of the usual 44 characters output is the TokenId. LinOTP will only take the first 12 characters, even if 44 characters are entered. As the token object in LinOTP gets assigned a new random serial number, enrolling the same YubiKey again will create a second token object in LinOTP, which of course could be assigned to a different user. The Challenge Response mode is identified by the token type “TOTP”. The prefix of the serial numbers start with “UBOM”, as this is also an OATH mode. The serial number of the token in the LinOTP database will be read from the YubiKey hardware. 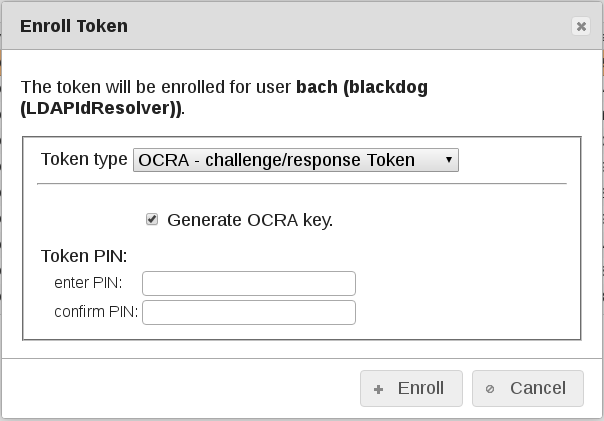 So if you enroll the same token a second time, it will overwrite the token object in the token database. The YubiKey has two slots, that can hold different content. The first slot is used by pressing the button shortly, the second slot is used by pressing the button for about 3 seconds. The token type “pw” is a static password that can be prepended with an OTP PIN. This token type is also used in the lost token scenario. If you selected a user and this user has an e-mail address defined in the user store, this address will be automatically entered in the e-mail field. You may of course change this. Press OK and the token with this e-mail address is created and assigned to the selected user.